Just a quick note to let folks know that the Classic Sports Car Club "Swinging 60's" race series are racing at Mallory Park on 25th May (Bank holiday Monday). Qualifying in the morning with racing in the afternoon. Paul Turnbull will be there in his Orange SE5 #14. I believe John Leslie will also be there in his Sabre 6 #4, the entry list is not yet finalised, but there will be many more classic cars (including a 3L Marcos #75). The Swinging 60's race is 40 minutes with mandatory pit-stop, so there is plenty of action to see. 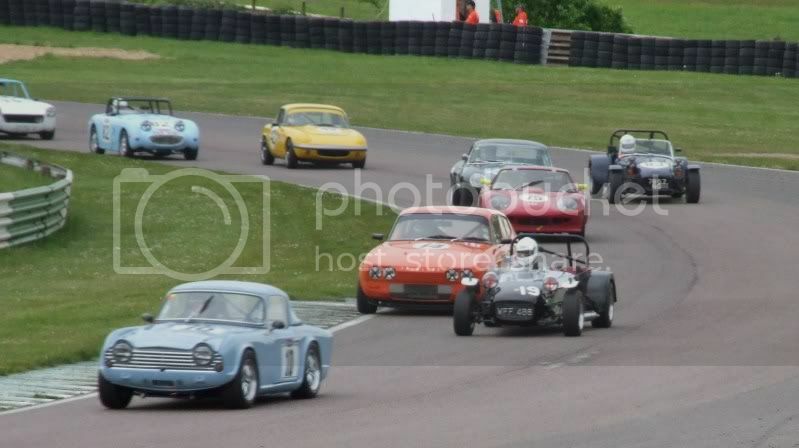 Also racing are: Future classics (40 mins); Ginetta Heritage race (20 mins); Classic Triumph (30 mins); open Sports v Saloons challenge and others. My supply of free tickets is already taken, so I've got none to offer up - sorry. I will be coming to watch, do either you or Paul need a hand? Raz987 wrote: I will be coming to watch, do either you or Paul need a hand? cant make it im afraid Chaps, but will be rooting for ya. Hey Raz, it will be good to see you. I guess your taking a rest from all the jobs on your car... I think me & Danny are ready, but come on over. You never know what's to do after qualifying! I've not got any spare tickets left, but Paul might have a spare that he can put on the gate for you? The Future Classics are racing straight after us, so you'll be able to see what's running in that at the moment. BigBobPilot wrote: I've not got any spare tickets left, but Paul might have a spare that he can put on the gate for you? The weather was better than predicted towards the end of last week and it looked like being a fine day.. I got the car off the trailer and took the bonnet off to see my anti roll bar drop link hanging down This wasn't an issue as it would just fasten back on, but it must've happened at Anglesey as the bracket holding it to the wishbone on the other side had pulled through the two bolts holding it to the wishbone. The car had been in storage since Anglesey and I'd not been able to do my usual checks..
Now Ben and Danny had arrived, and we got on with drilling a hole in the bracket to fasten it via one bolt which should hold for the race!!?? The lights went out and I got away well, the TR took the lead into Gerrards, followed by the 7, myself with Danny behind. 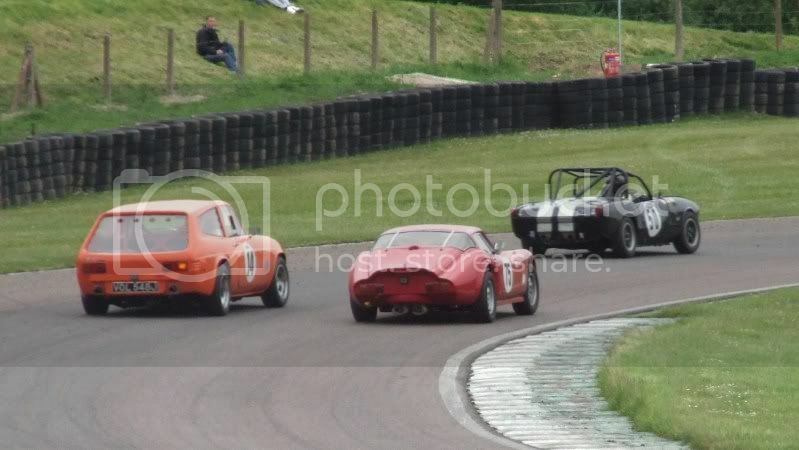 The 7 got away but I managed to close back up through the esses and got him under braking into the hairpin...2nd! Not for long though as my car wasn't too quick out of the tight hairpin and he got along side me before I could block, he was through and pulled away by around half a second per lap as per the difference in qualifying. I tried to drop Danny for the next 10 or so laps but the Marcos stayed around 3-4 car lenths behind me, then we started to lap the slower cars and I was a bit more aggressive with them allowing me to build up a bigger margin before my pit stop.. I came out of the pits and a red Marcos shaped blur appeared in my mirror and swept around my outside into Gerrards... The chase was on I got within a few car lenths and the only place I was quicker was through the Esses up to the hairpin, I tried to get down the inside into the hairpin under braking several times, but Danny was wise to this and closed the door and got much better drive out every time and opened the gap again, I got a good run and we were side by side going into the braking zone I was on the inside again and along side as we approached the corner, I've got him, at this point the door was firmly closed causing me to lock up as that's the last car I want to T-bone We exited and the battle continued.. As we came into the Esses a Midget was in our way and this slowed Danny a little more than me as the Midget moved more off line for me, I had a run and went to the outside this time, Danny covered and pulled to the outside at which point I jinked to the inside forcing him wide at the apex as he was on the outside, I blocked on the exit knowing he'd have me on acceleration given half a chance and I was through That was fun!!! The rest of the race was less eventful and I never saw Ben in his stint driving the car. 2nd and 3rd place, but no trophies! Unlucky guys. Great pictures Raz and good to see you there on the day. 2nd is Pauls best result since he started racing, and 3rd mine (shared drive with Danny in the Marcos). We were all really pleased , although it might not look that way in the mug shot. Anyway enough of bigging him up - Oulton looks like it could be interesting Paul! i think Ben has a good point about Paul, hes doing a great job of improving the image of scimitars which will ultimately benefit us all. More marque interest, more value to our cars (some see that as a bad thing though..) but has huge benefits for the Club when it tries to get insurance deals, track hire, advertising and show space, and has the added benefit of keeping the few traders/specialists that still have a soft spot for scimitars interested in stocking, servicing and developing the cars and parts. Seriously though, a massive achievement to get so far up the Classic racing ladder in a short space of time. Ive seen the cars they are competing against and some of the prep levels are stunning, and the money ploughed into them is scary . OK enough of being nice, its making me queezy. Has anyone else noticed that Bens sat down and still as tall as Danny and Paul? 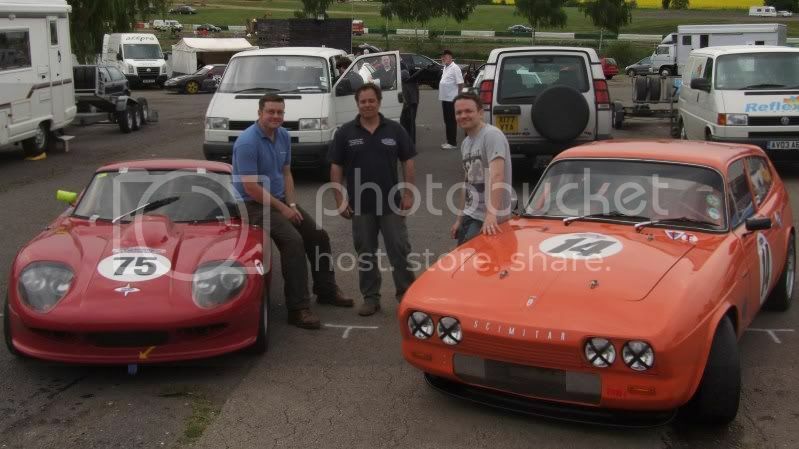 how the hell do Ben and Danny both fit in that Marcos 'GTE in a frock' ??!? Paul - cracking result, matey! Keep up the good work..
Ah well, as they say - the most important nut on a car holding it together is the one grabbing the steering wheel.. Need to get that anti-lag working - or get one of the old-fashioned superchargy thingies..
As you know, Craig -sod the bhp figures - its torque that wins! CNHSS1 wrote: Has anyone else noticed that Bens sat down and still as tall as Danny and Paul? how the hell do Ben and Danny both fit in that Marcos 'GTE in a frock' ??! ?